Simon Chan and his friendly colleagues, look forward to welcoming you one of Sydney’s favorite “local” Chinese restaurants serving you grate Chinese food, together with genuine friendly service. Click on our below video to see what Fortune Village is all about. Fortune Village Chinese Restaurant was established in 1981 and continues to be operated by the same family, providing local and international diners with fond, memorable dining experiences. Simon Chan and his team pride themselves as being a cut above your “local” Chinese restaurant, serving great, reliable Chinese food. Their dishes are traditional, having many provincial influences, and some with modern twists. At Fortune Village, it’s about the personal touch, the smile, the welcome and the “thank you” for choosing to dine with us. If you’re in the city and interested in experiencing some great Chinese food, served with sincere friendly service, come and see us at the Fortune Village Chinese Restaurant. Tender pieces of sliced marinated Beef fillet served with a light, creamy wasabi sauce. Consistently great Chinese restaurant favourites, Black Bean, Sweet & Sour, Szechuan Chilli, Satays, Curries, Salt & Peppers, Noodle & many more. Try our trio of pancakes - spicy Lamb, Diced Duck meat in Hoi Sin Sauce & diced Chicken meat in a X.O. Chicken. 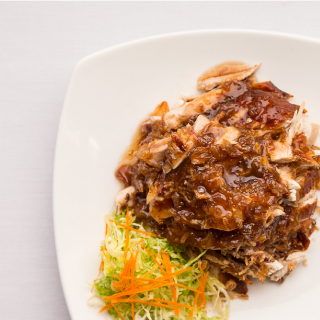 A roasted Chicken, deboned, the meat sliced and then our famous Tamarind sauce layered over the Chicken and sprinkled with crispy sliced baby shallots. We can also adjust menus to cater for vegetarian, gluten free & other dietary requirements. Please be mindful that our food may contain traces of seafood, eggs, peanuts or other allergic products. Other menus can also be designed around your requirements or budgeting needs. All prices are inclusive of Goods & Services Tax. Corkage Charge $5 per person for bottled wine only. All other beverages to be purchased from the Fortune Village Chinese Restaurant. All prices are inclusive of Goods & Services Tax. Please be mindful that some wines have traces of seafood, egg or other allergic products. Please drink responsibly. At Fortune Village, we practice the responsible service of alcohol. Fortune Village Chinese restaurant synergies of great food, sincere friendly service and dining in a warm and comfortable setting. Sydney’s CBD favourite local Chinese restaurant. Click our photos to see more. PLEASE PHONE RESTUARANT 92997273 TO MAKE A RESERVATION.